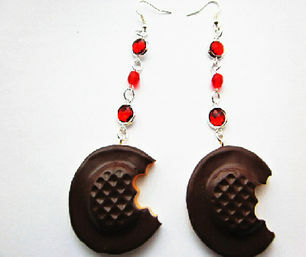 Large handmade fimo clay half eaten chocolate biscuit earrings with man-made ruby gemstones and red Czech firepolished beads. Nickel-free silver plated fish earring hook. Biscuit is made from non-toxin clay. Due to the handmade nature of these types of product, styles and sizes may vary from picture.